The beetle commonly referred to as “stink bug” is an invasive species of insect that was introduced here from Asia in the ’90s by means of commercial trade. Since they are not native to the United States, they have no natural predators here and their population has been growing out of control. Although they do not sting or bite and are not harmful to humans or property, they are already posing a serious problem for farmers because they eat fruit and other crops. Lately they have been spreading unchecked into the Northeast region. Stink bugs are beginning to make their presence felt in southern New York and Long Island this fall. As the weather grows colder they will begin to seek warm places to take shelter, and many homeowners will find themselves with unwelcome guests. If stinkbugs are found in the home, office, etc they can be a serious nuisance. When threatened or crushed, they emit a foul smelling, acrid odor that could be compared to the smell of a skunk. The repugnant odor is usually harmless, although it could potentially cause an allergic reaction in humans or be harmful to animals if sprayed directly into their faces. For more information on how to get rid of the offensive odor, here is a link to a separate article and video on how to recover from being sprayed. Make sure that doors, windows, and vents are screened and any holes or cracks leading into the house are sealed. Any hole around a door or window that is big enough to put a nickel through could allow these bugs to enter your home. This article contains more in depth information as to how to go about sealing off potential access points. Air conditioning units that are window mounted are another common point of entry, so if possible these should be removed as well. If stink bugs are found outside around the property, feel free to crush a few of them using an old newspaper or stone. 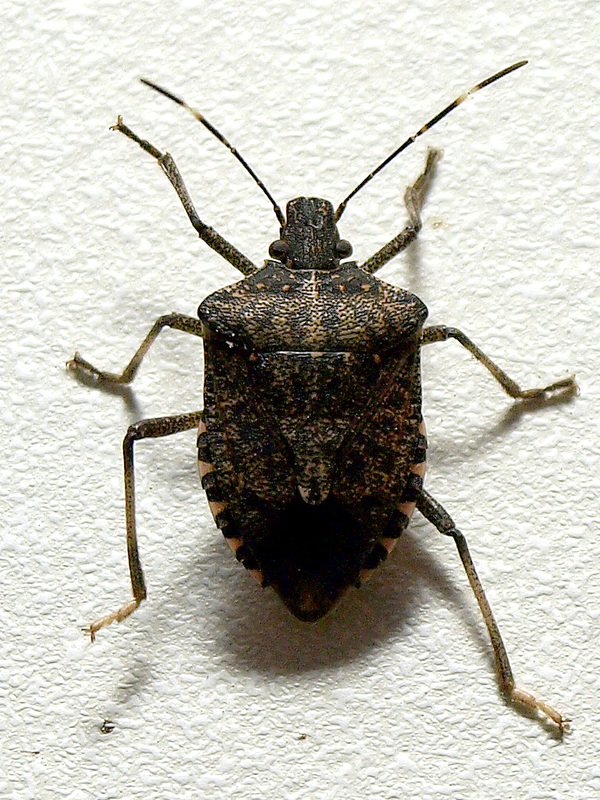 The odor that is released when they die will serve as a warning to deter other nearby stink bugs. It is also helpful to keep the plants around the house trimmed and to cut any overgrown weeds, especially those that are close to the foundation. One way is to mix liquid dish-washing soap into a bucket of water and, using either a gloved hand or other implement, knock the bugs into the water where they will not be able to survive. Another way is to knock them into an empty bottle and then immediately seal the lid to contain the smell. If it is cold enough you can throw them outside and let them freeze, or else flush them down the drain or seal them tightly in a plastic bag. They can also be sucked up into a vacuum cleaner, but make sure to use one with a disposable filter or else the smell may linger on the vacuum. This entry was posted in Uncategorized and tagged Arrow Exterminating, Insect, Invasive species, Long Island, New York, Odor, Pest control, stink bug on October 24, 2013 by ArrowBugBlog.